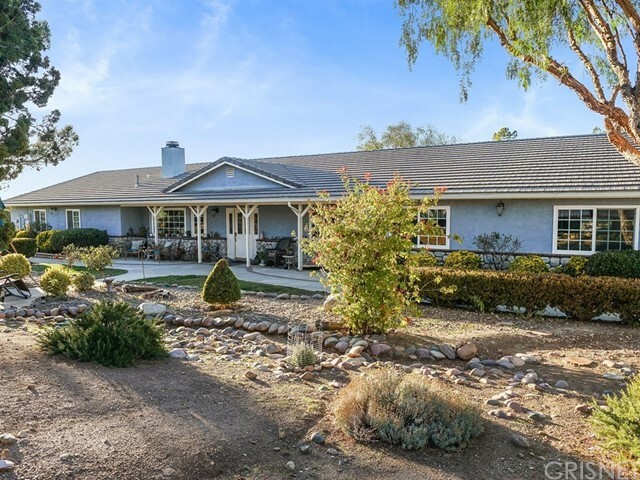 Sitting at the foothills of the majestic Sierra Pelona&apos;s, this storybook home welcomes you in through a path of beautiful pine and junipers. A quiet entrance into a spacious 2,396 sq ft of living space. Living room with cozy red brick fireplace and bay window. Remodeled kitchen w/ granite counters, tile flooring & stainless appliances. Family room woodburning stove warms in the winter. Beautiful wood flooring through a wide hallway lead to the master bedroom w/remodeled bathroom, claw tub & glass shower. Seperate entrance to covered patio and park-like setting back yard. This home also features an outdoor swim spa and hot tub. Aprx 3 ac, level and completely fenced. Plenty of room for an arena, barn, animals or toys. Oversized 3 car garage and paid for solar! Tons More! Come See!